Chris lays out the plan for the final episode and issues a challenge to the livestream to come blow him up in a PvP extravaganza. Chris with Jupiter Force vs. The STOked Live Stream. An epic battle is closely fought and hilariously narrated with phasers and torpedoes and mines…oh my! The team is joined by an original member, Bridger, to review the latest mission from Alimac30 titled “The Mayns Of Balnar Moon”. Could it possibly be the best mission they have ever reviewed? You’ll just have to tune in to find out. Nikki stops by and shares her recommendations for Odyssey/Bortasqu builds for tac, eng & sci! STOked Radio will live at Jupiter Force. You can watch a special math segment over there! 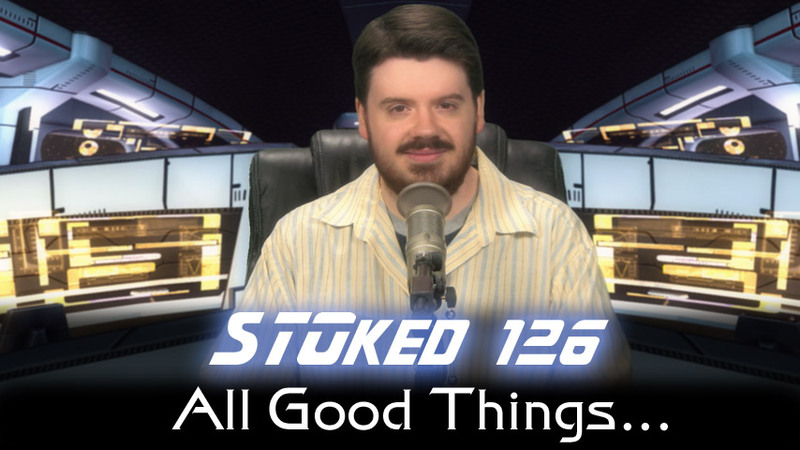 Mav joins Chris to talk about some of the upcoming projects and the initial plans for STOked radio. With the Star Trek Las Vegas convention coming soon, the pressure is on to get things up and running as soon as possible. A series of clips that highlight some of the funniest and most important moments in STOked over the last three years. Chris signs off with his final thoughts and wishes for the future.